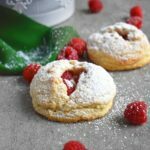 Raspberry Scones: soft on the inside, buttery and flaky with a delicious raspberry twist; so perfect in every way. These scones will complete your breakfast coffee or afternoon tea. If you don’t know yet, I love scones! I love them in any shape and flavor. That buttery and flaky texture and the different fruity toppings make it all better. Scones are the easiest dessert to throw together and everyone loves them! I have never met anyone who said ‘no’ to a fresh scone. This scone recipe is slightly different than the usual ‘pat a circle and cut into eight wedges’. It’s time to get creative! These have the festive look to them and just perfect for these days, where everyone is eating everything Christmas! 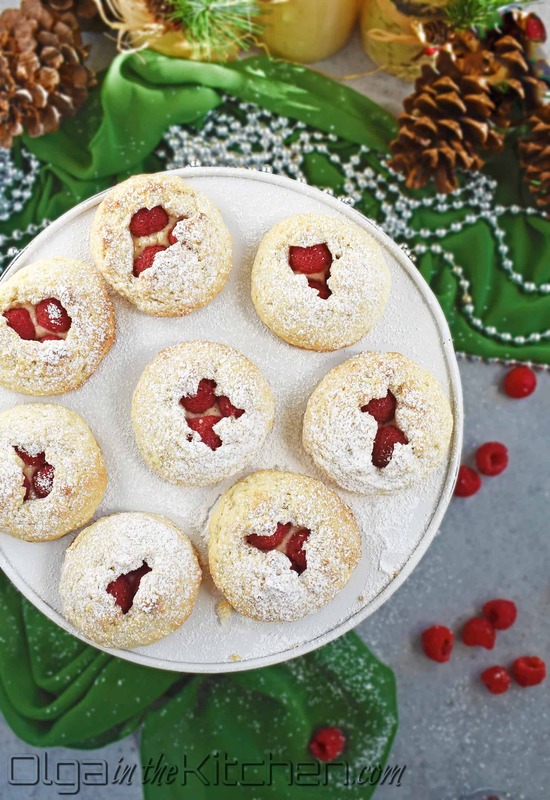 In fact, these look a bit like Christmas cookies – a 3″ flaky cookie. When you cut the dough with biscuit cutter, you will have dough scraps. You can either pat circles from those scraps or just bake them as scraps. Do not throw these away! Those are that same scones minus the raspberries inside. 🙂 Never dispose dough unless you really have to. When making scones, it’s important to keep all the dairy ingredients cold. The eggs, heavy cream and butter. 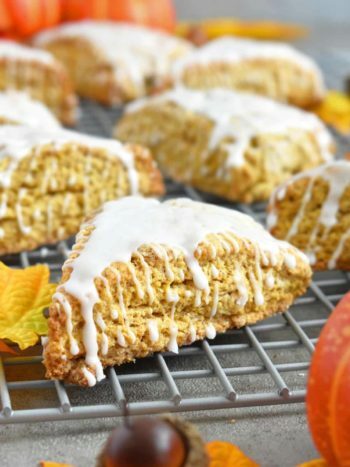 Cold dairy ingredients will make the scones flaky, moist and melt-in-your mouth. Because we roll out the dough and letting the dough spend some time at room temperature, I refrigerate them for 10-15 minutes just before the oven to keep them flaky and irresistible! 1. Line a parchment paper with a 11×17 baking sheet and set aside. In a large bowl, combine and whisk 2 cups all-purpose flour, 1/3 cup sugar and 2 tsps baking powder. 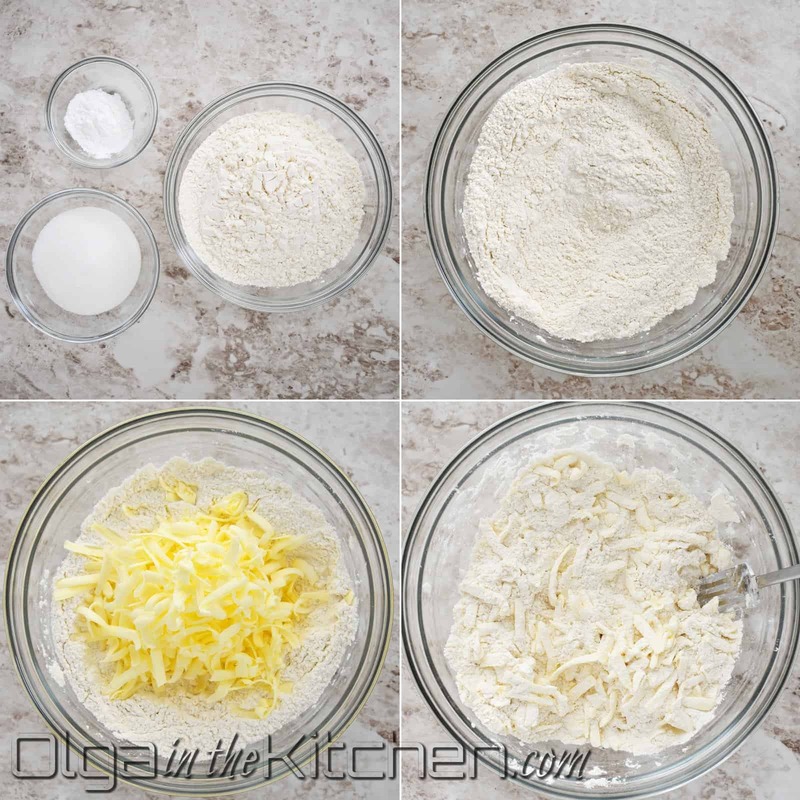 Grate 1/3 cup refrigerated unsalted butter into the flour mixture on the large holes of grater. Work in the butter with a fork until the mixture resembles coarse meal. 2. 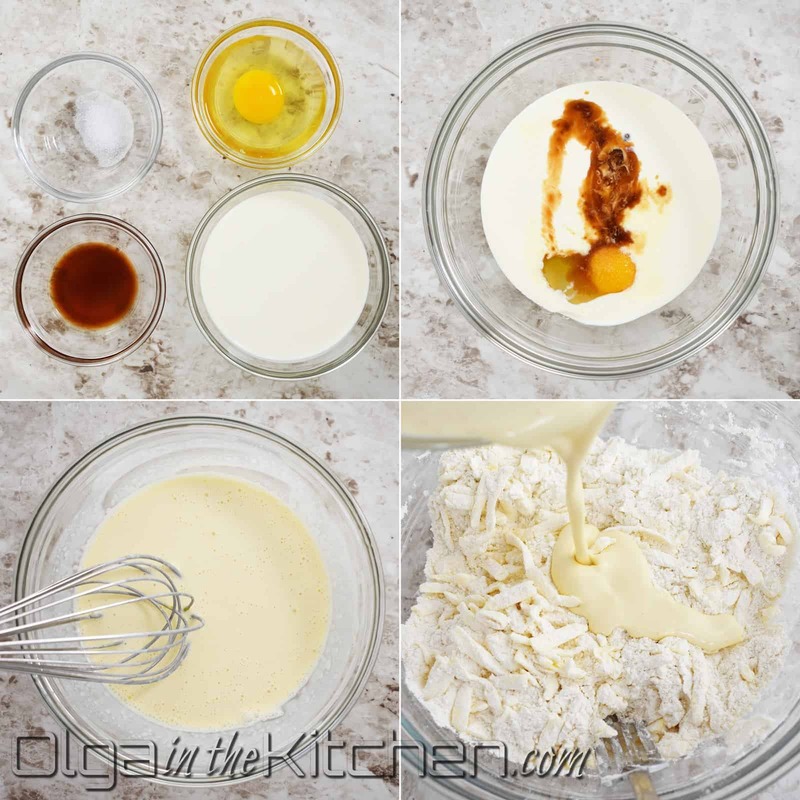 In a separate mixing bowl or liquid measuring cup, combine and whisk 1/2 cup heavy cream, 1 egg, 1 tsp vanilla extract and 1/4 tsp salt until smooth. Add the liquid to the dry ingredients. 3. Stir all ingredients with a fork until the dough starts to come together. Using your hand, continue by pressing the dough against the bowl into a ball. It would seem as there’s not enough liquid in dough and you’ll see lose flour, but as you press – the dough will come together. (Do not overwork the dough!). Transfer the dough onto a lightly floured surface, knead 3-4 times, and pat into a rectangle. Roll the dough out to about 11×17 rectangle or 1/4″ thick. Using a 3” diameter biscuit cutter, cut out 20 circles. (I got 16, gathered dough scraps, rolled out the dough again and another 4). (Do not dispose those extra dough pieces. Bake them and enjoy with a cup of coffee or tea. ). Place 3 raspberries in center on a dough circle open side down. Cover with second circle and gently go around edges to connect and seal the two pieces as you would seal a pierogi. 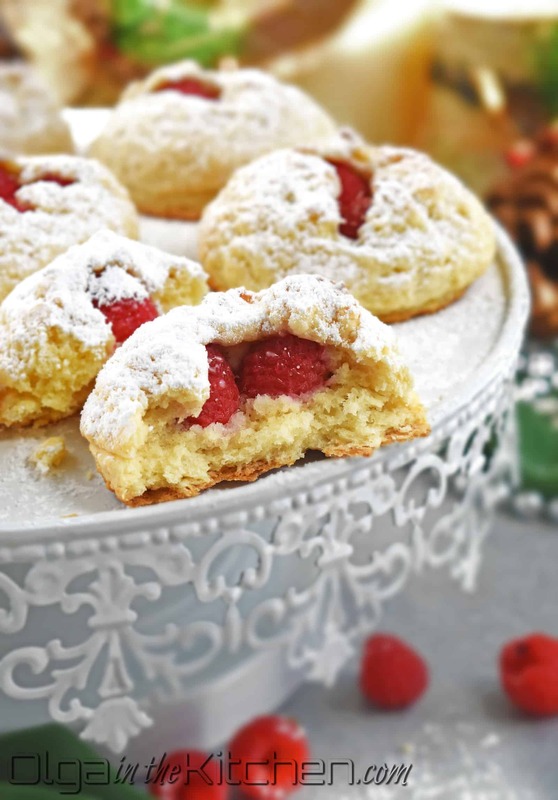 Take the scone into hands and lightly press your thumb in at the bottom to make the raspberries pop out on top (use your fingers to help make the opening if necessary). Repeat for remaining scones. 4. 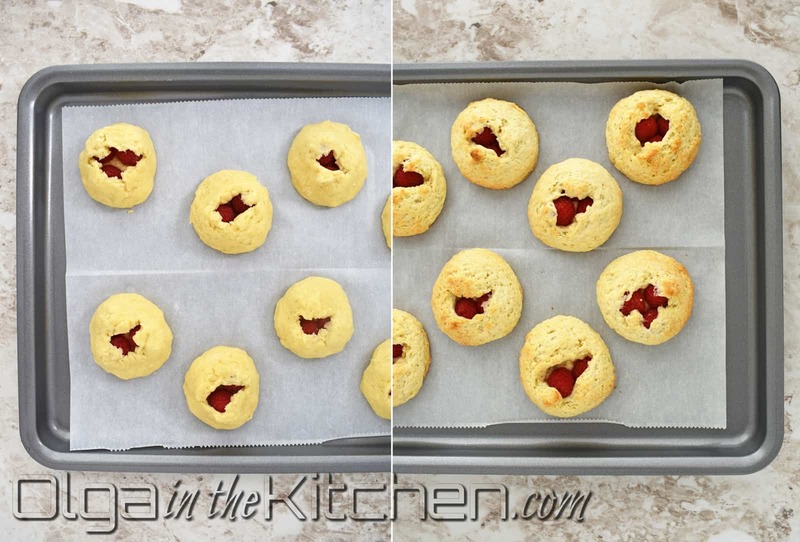 Place the scones on a prepared baking sheet 1-2” apart and refrigerate for about 15 minutes. Meanwhile, preheat the oven to a 400°F. Bake for 13-15 minutes until golden (I did 13). Transfer onto a cooling rack and dust with powdered sugar once cooled. Serve with a fresh cup of coffee or tea! These scones are delicious for up to 3 days at room temperature. Anolon is my primary cookware and bakeware. About 6 years ago when I saw the beautiful Anolon Nouvelle Copper Hard-Anodized Nonstick 11-Piece Cookware Set at my sister’s, I decided to buy it for my self. No regrets! The quality and the beauty always satisfied me. Over the years, I kept adding more of their products to my kitchen, such as knives, griddle, pizza pan, saucepans, skillets, muffin pan and especially their baking sheets. The non-stick coating makes it super easy to clean, bake and maintain. I am giving away a beautiful Anolon 3-Pc Nonstick Baking Sheet Set. This giveaway is not sponsored. It’s my personal thank you to all of my readers for helping me get where I am today. Also, who wouldn’t love a baking sheet set just in time for Christmas with all the cookies to be baked for Christmas Eve! Enter the giveaway below! AND THE WINNER IS…..Angela Bo…Congratulations! Use one or all giveaway entry options for more chances to win. Click the check box at the right to enter on each entry. If you’re having trouble with entering, feel free to post your questions in comment section below. Giveaway ends Tuesday, December 11th, 2018 at 11:59pm (Pacific). Winner will be randomly selected shortly after. 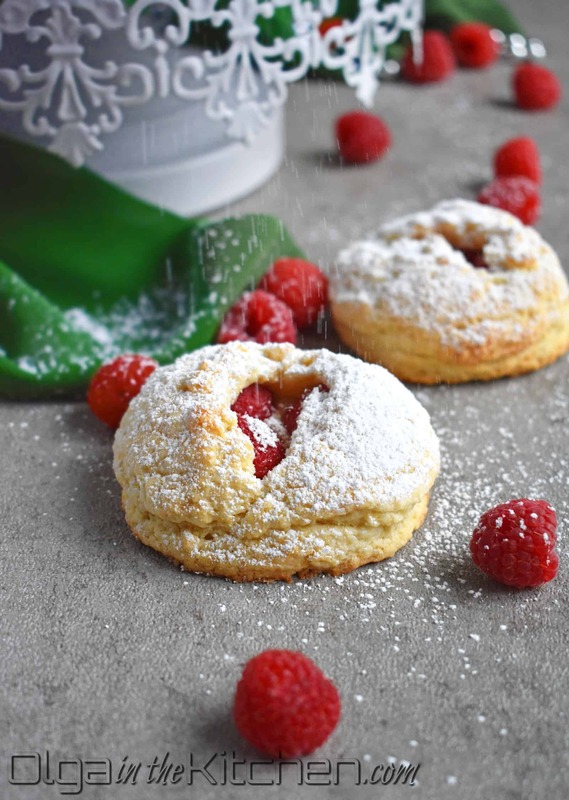 Raspberry Scones: soft on the inside, buttery and flaky with a delicious raspberry hint; so perfect in every way. Line a parchment paper with a baking sheet and set aside. 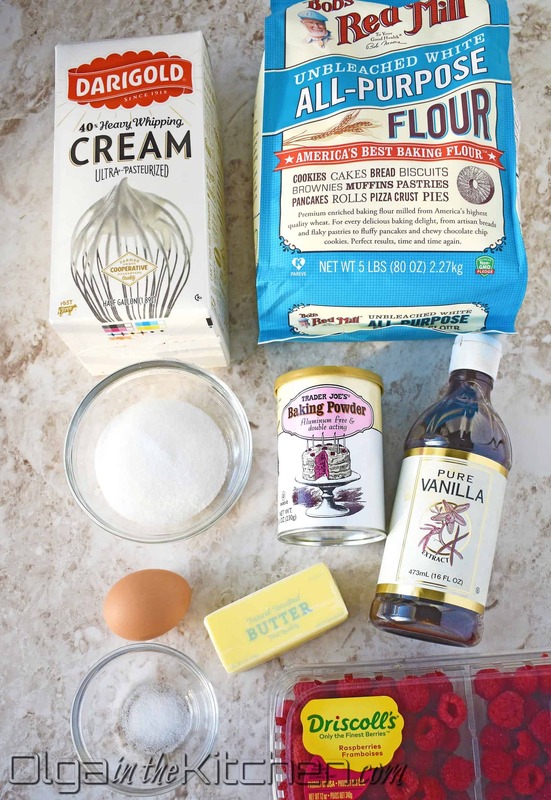 In a large bowl, combine and whisk 2 cups all-purpose flour, 1/3 cup sugar and 2 tsps baking powder. Grate 1/3 cup refrigerated unsalted butter into the flour mixture on the large holes of grater. Work in the butter with a fork until the mixture resembles coarse meal. In a separate mixing bowl or liquid measuring cup, combine and whisk 1/2 cup heavy cream, 1 egg, 1 tsp vanilla extract and 1/4 tsp salt until smooth. Add the liquid to the dry ingredients. Stir all ingredients with a fork until the dough starts to come together. Using your hand, continue by pressing the dough against the bowl into a ball. It would seem as there’s not enough liquid in dough and you’ll see lose flour, but as you press - the dough will come together. (Do not overwork the dough!). Transfer the dough onto a lightly floured surface, knead 3-4 times, and pat into a rectangle. Roll the dough out to about 11x17 rectangle or 1/4" thick. Using a 3” diameter biscuit cutter, cut out 20 circles. (I got 16, gathered dough scraps, rolled out the dough again and another 4). (Do not dispose those extra dough pieces. 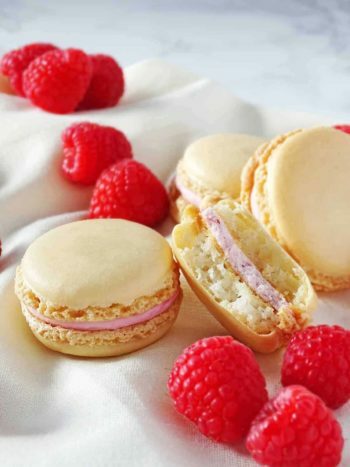 Bake them and enjoy with a cup of coffee or tea. ). 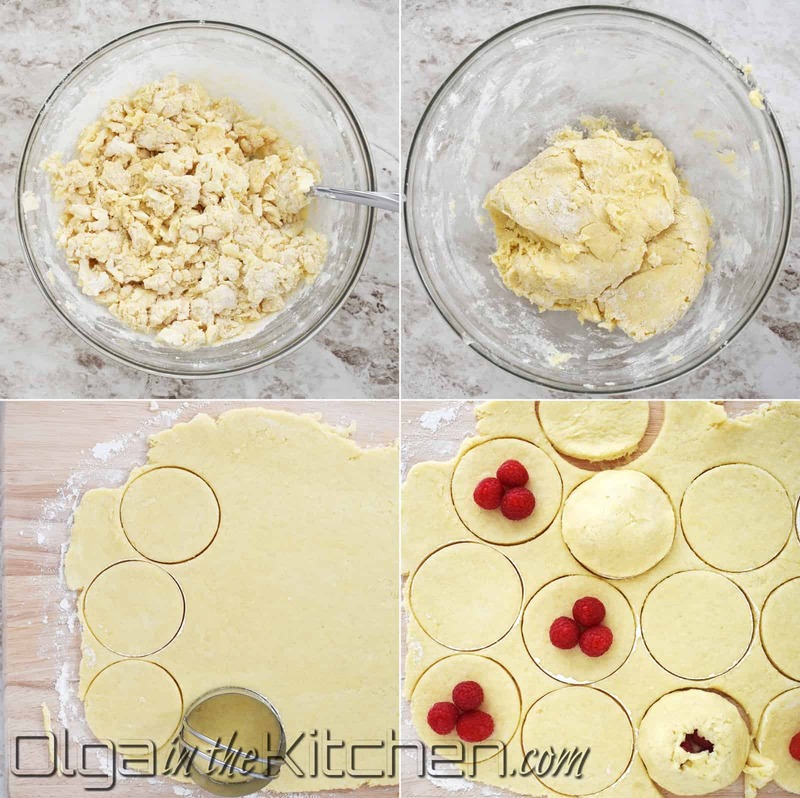 Place 3 raspberries in center on a dough circle open side down. Cover with second circle and gently go around edges to connect and seal the two pieces as you would seal a pierogi. 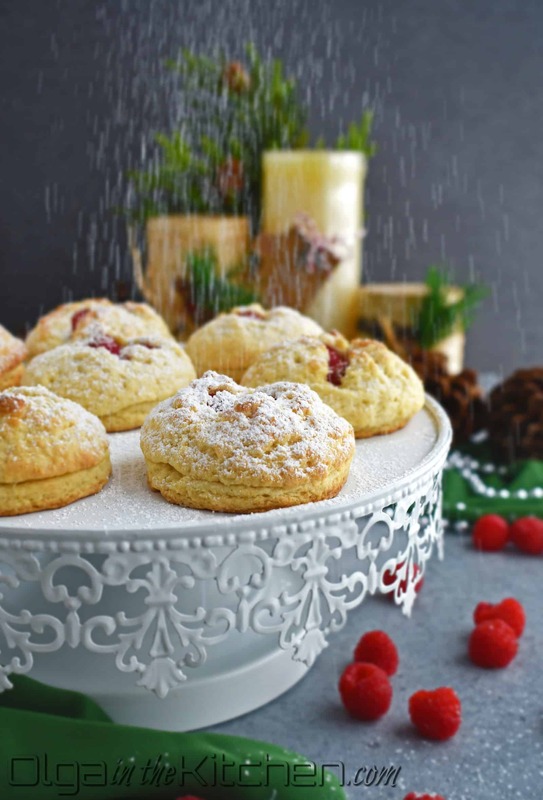 Take the scone into hands and lightly press your thumb in at the bottom to make the raspberries pop out on top (use your fingers to help make the opening if necessary). Repeat for remaining scones. Place the scones on a prepared baking sheet 1-2” apart and refrigerate for about 15 minutes. Meanwhile, preheat the oven to a 400°F. Bake for 13-15 minutes until golden (I did 13). Transfer onto a cooling rack and dust with powdered sugar once cooled. Serve with a fresh cup of coffee or tea! These scones are delicious for up to 3 days at room temperature. 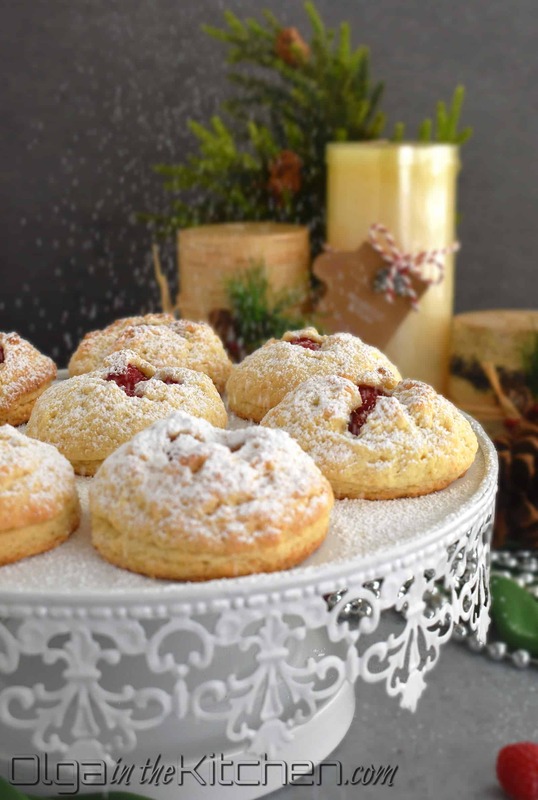 Awesome scone recipe! Would love to win the giveaway!! My favorite dessert to make is boccone dolce. I love panna cotta too! ? 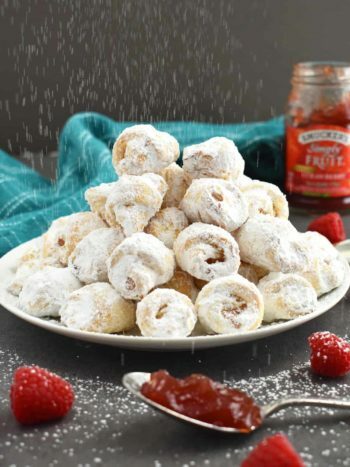 It’s a great dessert for upcoming holidays! Thank you? I’m a big fan of salads too. I’ll make sure to post more of them soon! My favorite dessert is honey cake. Such a delicious choice! It never gets old!? I like to try making any kind of cookies, especially for the holidays! Cookies are always a good choice! If you have kids, nieces or nephews they really love to help!? Mine do all the time teven if my kitchen gets a bit out of hand? My favorite cookie would be oreshki! LOVE oreshki! Such a good choice – I make them once a month at least? My favorite dessert is oreshki cookies. Such a delicious choice! It’s perfect for Christmas!? 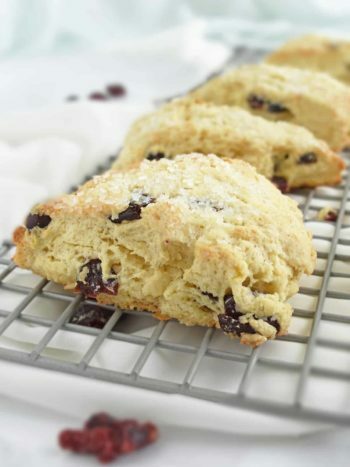 Scone recipe looks great and I will definitely try to make! I love to bake so many things. Top three would be sweet kolaches, cheesecake and all types of cookies/bars. I love to bake cookies and watch my girls decorate them. They are so creative. Thank you for the wonderful giveaway! My favorite are oatmeal scotchies, but that has more to do with the handfuls of butterscotch chips I eat before we make them!!! I love baking cookies! Especially a vintage sugar cookie recipe I got from my mom. Brownies and cookies are my favorite to bake. I love making lemon squares. Never tried those, but sound really delicious! ? I used to be a wedding cake designer and that’s still my favorite thing to bake. That sounds like a lot of fun. I love to decorate cakes too, but I’m pretty sure I’m nowhere as good as you!? I love baking whoopie pies. Chocolate cake is always a winner! Those look so good, I’ve never made scones before! I love baking though, especially cakes! You should definitely try making scones! They are the easiest dessert and extremely delicious, especially fresh! ? Oh I love Russian teacakes..they are so addicting! I love making apple pies!! My favorite dessert would be a toss up between chocolate pie and carrot cake! Lol! Just love both!